On Aug 2, 2006 Debbie Lee received a knock on the door that changed her life. She was notified that her son Marc Alan Lee had been killed in action, becoming the first Navy SEAL killed in Iraq. Part of his story is written and depicted in Chris Kyle’s book, American Sniper because Marc was part of SEAL Team Three, Charlie Platoon. Since that day Debbie has dedicated her life to ensure that our troops and military and Gold Star families have access to respite and important services that help assist recovery after injury or loss. Chase Dodson, a junior at Cactus Shadows HS and Life Scout with BSA Troop 15 in Cave Creek, set out to help Debbie by completing his Eagle project for America’s Mighty Warriors. 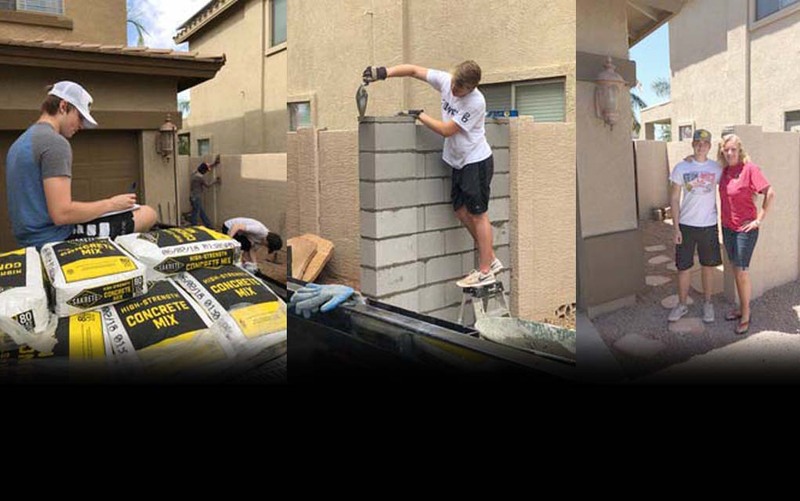 This summer he raised over $!000 in funds and, with the help of other young men in the Cave Creek community, constructed a block wall at the Heroes Hope Home. This gave the organization the extra storage needed to run the home efficiently. He also created a memorial slide show and purchased several digital photo screens to honor the fallen troops in the guest rooms and shared living space at the Heroes Hope Home. Chase said “Part of my Eagle goal is to tell others about America’s Mighty Warriors. Marc’s wish was to encourage kindness, respect, and Random Acts of Kindness.” With Veteran’s Day approaching, he would be grateful if you would learn more about AMW at www.americasmightywarriors.org.